Four people were transported to the hospital to be treated for smoke inhalation and 11 others were treated at the scene and released after a five-alarm blaze broke out an apartment complex in San Jose Tuesday morning, according to the city's fire department. Kris Sanchez reports. 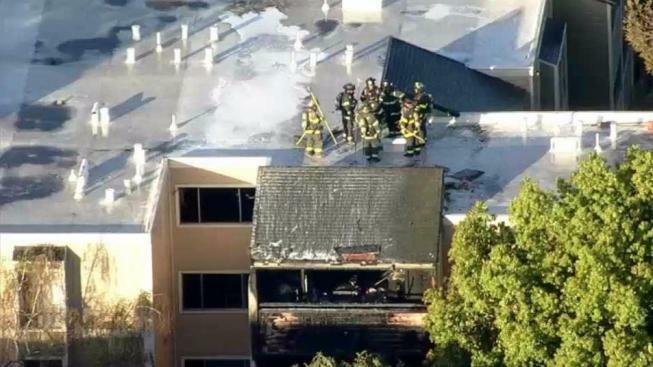 Four people were transported to the hospital to be treated for smoke inhalation and 11 others were treated at the scene and released after a five-alarm blaze broke out an apartment complex in San Jose Tuesday morning, according to the city's fire department. When the first round of firefighters arrived just before 6 a.m. to the apartment building located at 2079 McLaughlin Ave., they found aapproximately 20 people trapped on balconies, San Jose Fire Department Capt. Mitch Matlow said. "They were using sheets and ropes to try to get down," Matlow said. "They were removed from those balconies by fire personnel." The blaze ignited on the second floor and proceeded to take out units on the third floor, according to Matlow. Twelve units in all were damaged. Residents from 36 units inside the building were forced to evacuate as a result of the blaze, Matlow said. The cause of the fire is still under investigation, according to Matlow. More than 100 firefighters worked at the scene of the fire, according to Matlow.